There is nothing more special than an old school wooden playground. One filled to the brim with its own unique treasures, custom made for the space, and Mamma bets, these well loved characters have featured in plenty of family photos over the years. 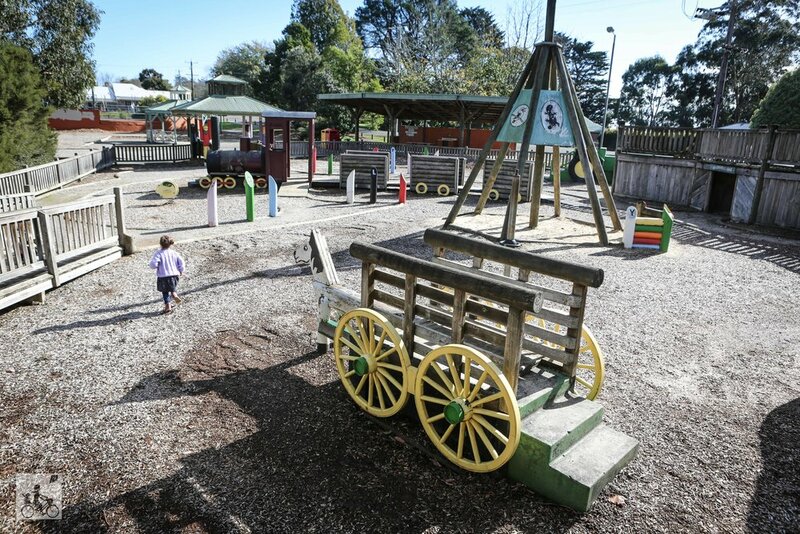 As soon as the kids pass through the friendly entrance, they will be inspired to ride the tractor, be a train driver and head off to explore the mines. There is a sandpit in the centre of the space and wiggly alphabet poles (where 'z' has mysteriously disappeared). Add into the mix a long wooden platform that provides great views of the space and you have a classic winner. The crawlers can even be let loose without fear of consuming all the tanbark. On the other side of the main playground you will find a set of swings and the skate park. Mamma has been informed that this treasure has been listed for a makeover (lucky thing!) but as yet, it is still open for play. You will notice that there is some equipment missing and the paint is a little tired, but Mamma just thinks this adds to the charm! Mamma's special mention: Time for lunch after this play? Head up the road to Spencer's Store or The Independent for something yummy! OR if you save your play date for 4th Sunday of the month, the Gembrook Market runs from 9am - 2pm right next door.